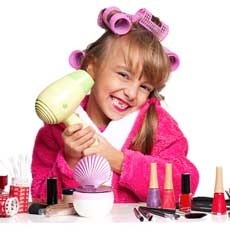 Sweet & Sassy is the SALON, SPA, & CELEBRATION place just for Kids! We do trendy haircuts for boys and girls of all ages and have fun SPA packages for girls. When you visit Sweet & Sassy you're sure to have the 'best day ever', when you party at Sweet & Sassy you'll have 'the best BIRTHDAY ever! ' Look around town for our HOT PINK LIMO, the best way to transport your little princess or celebrity. Need a perfect gift? Come shop in our Sassy Shoppe.